If you want to bring some of the night sky into your cabin, blanket fort, or tent then my Starry Night Luminaries are for you! This activity is really simple, and takes less than 10 minutes to complete. It does get a tiny bit messy because of the glitter, so you might want to spread some newspaper or rags in hopes of containing the glitter before you get started. 1. 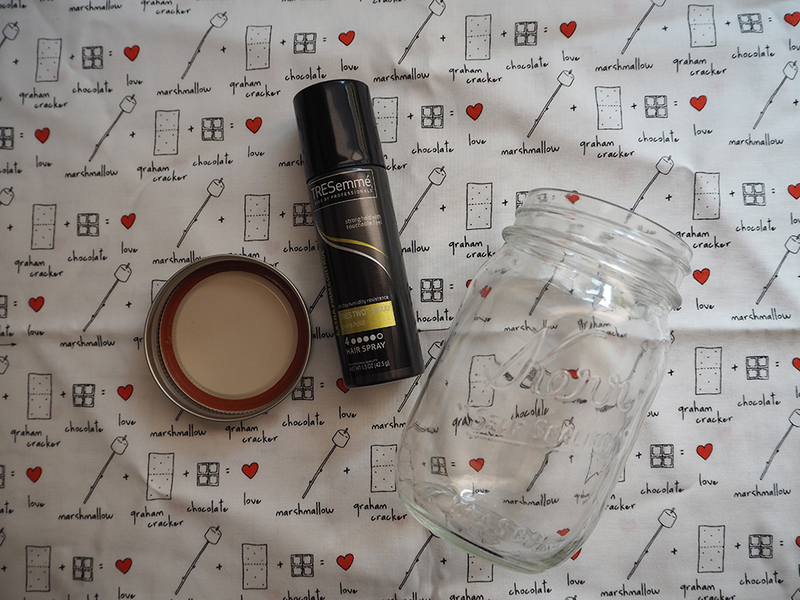 Spray the inside of jar/container with hair spray. Apply an even coat to the whole interior of the jar/container. 2. 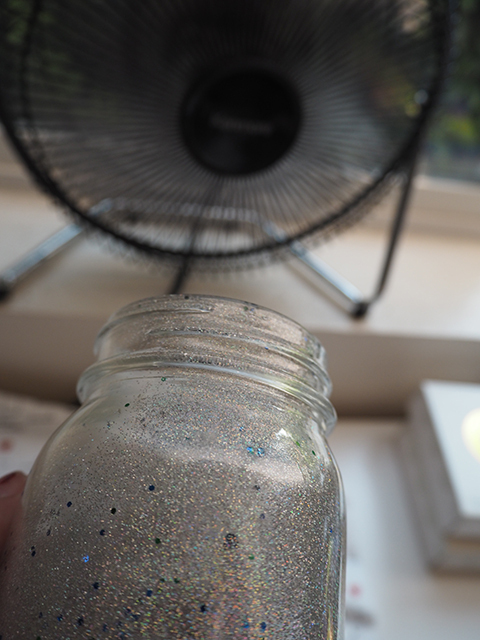 Pour a fair amount of glitter into the container. This can eaither be a lot or a little glitter, depending on how much light you want to be able to see. It also depends on the color of glitter your using, some can be more translucent than others. 3. If your container has a lid, place the lid back on, or cover your container using plastic wrap, tin foil, or whatever is available to you. 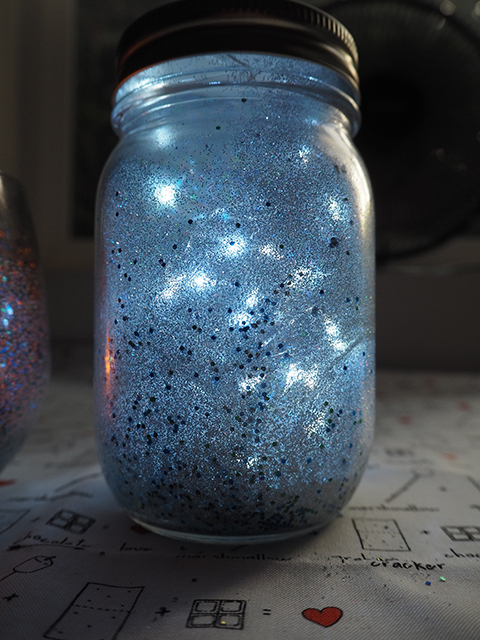 Shake, or slide the glitter around the container so that it covers up the inside of the jar/container. 4. When the glitter is spread to your liking pour any access glitter out. 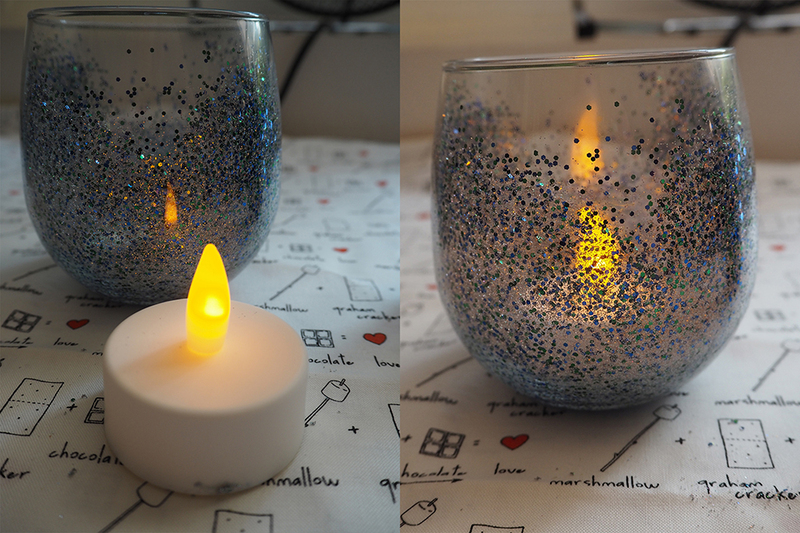 You can save the access glitter to make another Starry Night Luminaries or you can save the glitter for another craft. 5. **OPTIONAL** You can choose to wait for the inside to dry. You can put the jar in front of a fan or use a hair dryer for it to go faster. It took mine about 1 1/2 minutes to dry using a fan (seen above). 6. 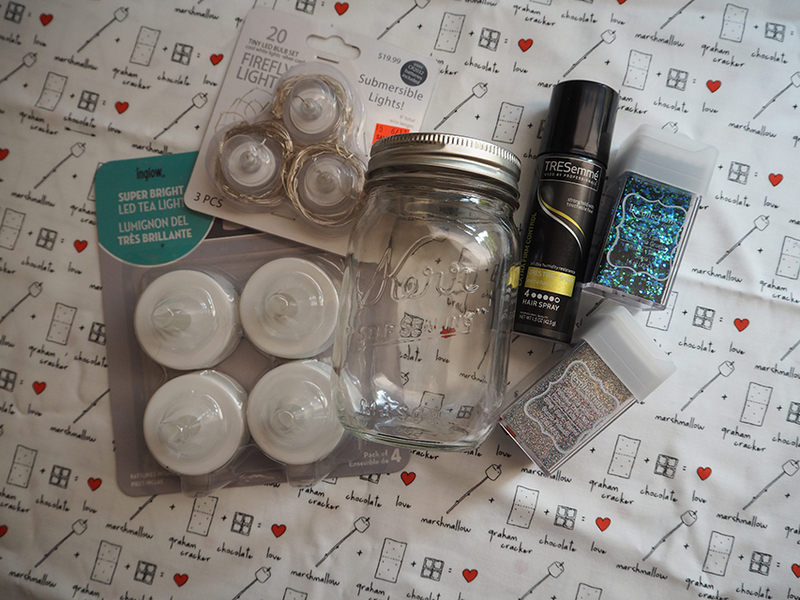 Place the light device of your choice (electric tea light or twinkles) into the jar/container, and replace the lid if it has one. 7. ENJOY! How easy was that? 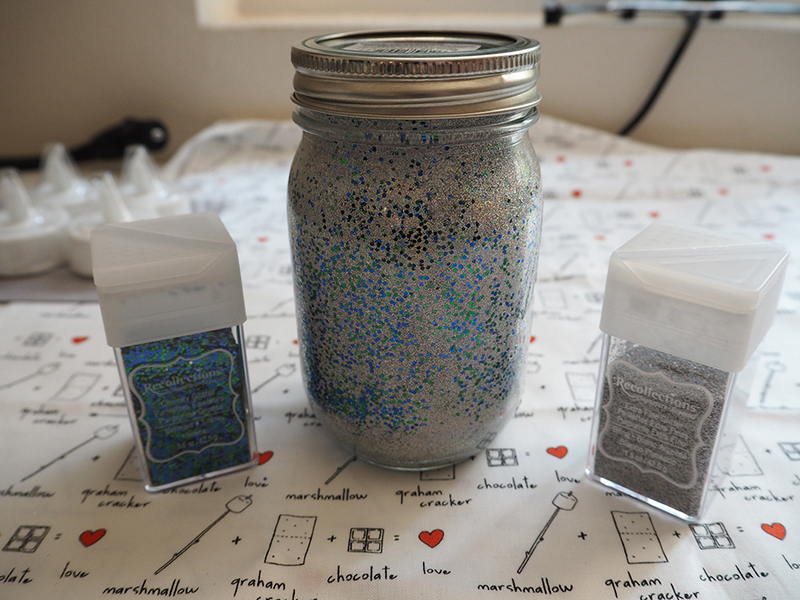 If you ever decide that you don’t want to have a luminary any more then you can rinse the jar/container out with warm water and soap and the glitter will come off, as well as the hair spray, bonus it leaves no residue behind. 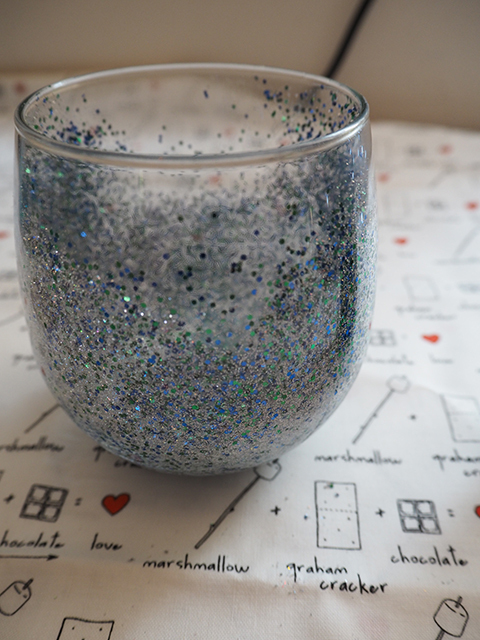 This is also helpful if you end up using too much glitter- I did this the first time creating these, what can I say, I get a little glitter happy. Please share your creations on Instagram & Twitter using #iggppcamp, @iggppcamp ,and @unicornprincez4 so I can share your creations! You can also post your creations on the forum for this activity.